That's right! 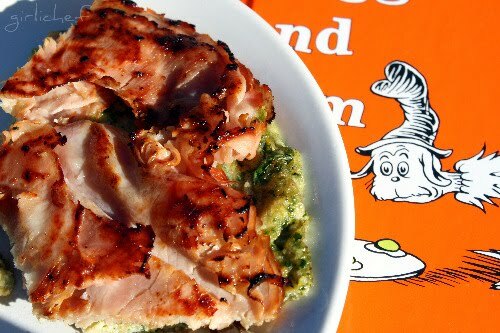 Green Eggs and Ham hit stores 50 years ago this month! Dr. Seuss is a genius and has been one of my favorite authors since I could read all on my own. I know he was one of my earliest influences (aside from mom & dad). His books were always my favorites...I can remember reading them over and over with my mom...There's a Wocket in my Pocket, In a People House....Green Eggs and Ham. Even in my public speaking course in college...I chose to read The Lorax as a speech. I love his writing, his inflections, his messages! Although I could go on and on about Dr. Seuss...I'm just going to focus on celebrating 50 years of encouraging us to try things before we make up our mind about whether we like them or not. "You do not like them. So you say. Try them! Try them! And you may. Try them and you may, I say!" We've probably all had the boring version...you know the one...the one they give you when you celebrate Dr. Seuss' birthday in school...the one where they add a few drops of ewwwww green food coloring and call it a day. 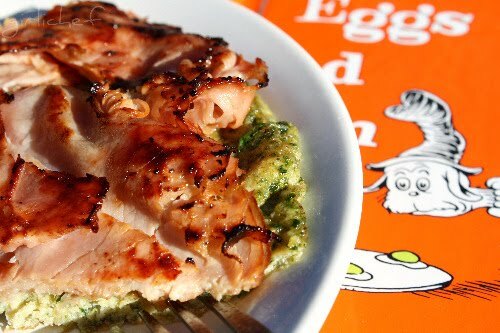 Well, the kiddos and I decided to use the abundant basil growing in our garden to turn our eggs green in celebrating 50 years of Green Eggs and Ham! Begin by throwing the basil in a blender jar and drizzling in a bit of olive oil. Blend until it is a nice, green puree. Beat your eggs together with a pinch of salt, a good grating of black pepper and fresh parmesan, and as much of the basil puree as you'd like, we used ~1/4 c. or so. Heat a good, heavy non-stick pan (or omelette pan) over high heat. Add a big pat of butter, then pour in your egg mixture. Slide it around the pan, using a heatproof rubber scraper to lift the edges and let the egg mixture spread under itself (in omelet fashion). Once most of the mixture is set, flip the omelet over and continue cooking until that side is just set. Remove to a plate. Put another pat of butter on the pan, if you wish and spread the ham out onto the hot skillet and cook until it has browned and crisped up nicely. Flip it over and repeat on the other side. Slide the cooked omelet onto the top of the ham once both sides are browned. Place a large plate over the top of the pan and quickly flip the whole thing onto the plate (or a cutting board). Cut into halves or wedges for serving! 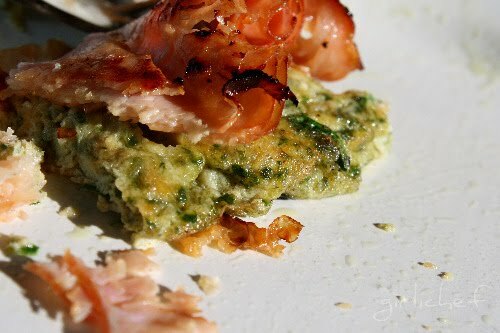 The fresh, bright, GREEN taste of the basil really shines and compliments the richness of the egg and the salty, crisp ham. 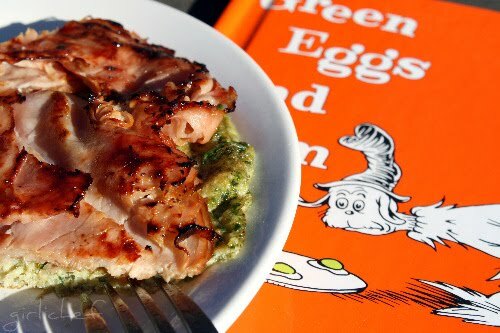 I absolutely adore this green egg and ham combination. I could probably eat it daily and be eternally happy. 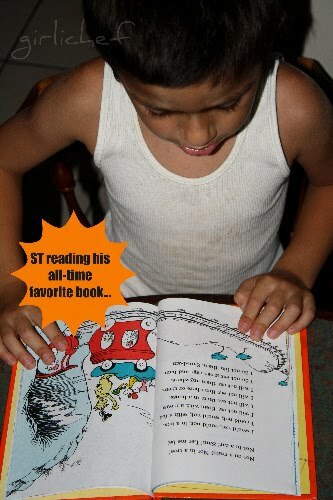 Green Eggs and Ham has been ST's absolute favorite book since he started loving books! He used to toddle over to me with it in his hands, wanting me to read it...he could listen to it over and over and over...day after day after day. Once he started reading all on his own and he could read it to me...you should have seen the look on his face! He read it at least once daily...and still pulls it out to read at least once a week you know, since he's older and all. Really, it's been a perennial favorite of all the kids in the family...from me and my brother and sisters to all of my kiddos. Yup, we've all loved food and reading about it since before we could read ourselves ;) . DQ is helping me snip the basil this morning and jawing non-stop this is normal about how the green eggs and ham are going to taste...reminding me that they ate green eggs and toast in preschool.. Skip forward to the actual making... DQ: why isn't the ham green, too. I wanted the ham to be green. Me: The eggs are green. I didn't figure you'd want basil in your ham, too. Me: hmmmm....note to self...figure out a way to make the ham green w/out making it nasty next time 'round. DQ: I LOVE THIS! I AM IN LOVE WITH THIS! IT'S SOOOO GOOD, MOM. Will you make this tomorrow, too? ST: MMMmmm (with eyes in wide-open-saucer-like surprise). Very tasty, mom. You're the best cook. LT: It's good. You can't even taste the eggs. (This is a compliment. He's always had an 'issue' with eggs.) Proceeds to eat the rest in rapid succession. Thanks for instilling the sense of wonder...the encouragement not to judge something until you've tried it... Dr. Seuss...you totally rock.